Try popping one into a gift bag for your guests to take away after a themed party or celebration and see how impressed they are! When your sweet tooth calls, sometimes you just have to listen! For perfectly portioned cakes and bakes Sweet Treats has a fantastic new range of electrical home-baking products, designed to give you and your family hours of fun in the kitchen – not to mention some great ideas for Christmas gifts. Sweet Treats includes a Mini Cup Cake Maker, a Whoopie Pie Maker; Brownie Maker; Cake Pops Maker; Brownie Bites Maker; Zoo Waffle Maker and a Popcorn Maker – perfect for indulging any sweet tooth, whatever the occasion! Sweet Treats Mini Cup Cake Maker - Making delicious cupcakes, without having to turn on the oven, sounds just too good to be true. Now, thanks to the Sweet Treats Mini Cupcake Maker you can turn out six mouthwatering home-made cupcakes in minutes. And it’s as easy to use as a sandwich maker – just plug in and the lights indicate when it is ready. For best results, simply pop cupcake cases into the easy clean non-stick holders, pour your favourite cake mix into the cases, close the lid and your perfect cupcakes are ready in ten minutes – ready to decorate with your favourite tasty toppings. 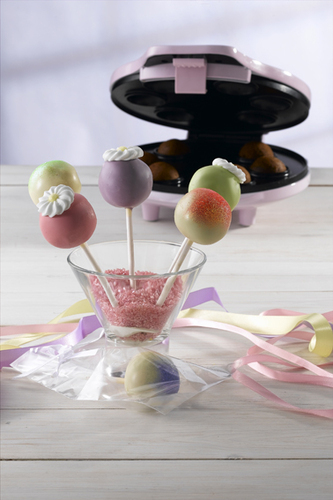 Sweet Treats Cake Pops Maker – For the latest twist on traditional cakes, how about the Sweet Treats Cake Pops Maker, which bakes six delicious cake pops in minutes. Once baked, simply add sticks and then get creative with the icing and decorations. Try popping one into a gift bag for your guests to take away after a themed party or celebration and see how impressed they are! Sweet Treats Whoopie Pie Maker – If it’s a whoopie pie you’re dreaming about – and who wouldn’t – then these treats are so easy to prepare with the new Sweet Treats Whoopie Pie Maker, that will turn out 4 delicious whoopie pies in minutes. Once baked, simply turn them out, fill them with your favourite flavoured filling and finish them off with a themed topping of your choice. Sweet Treats Brownie Maker – A deliciously squidgy rich chocolate Brownie will satisfy most people’s sweet craving and you can turn out 8 Brownies in minutes with this nifty Brownie Maker, ready to plate up and share with family and friends – perfect as a tea time treat! The Brownie Maker has easy clean non-stick cooking plates, with a divider which allows you to lift out the cooked Brownies onto a cooling tray. Sweet Treats Brownie Bites Maker – If you want to have your cake and eat it (in bite-sized portions), then look no further. The Brownie Bites Maker bakes 8 gorgeous mini brownie bites, or cake bites of your choice in no time at all. Simply pop the cake mixture into the non-stick holders, close the lid, wait for the ready light to illuminate then away you go – and you might have to try more than one bite, to see just how delicious they are! Sweet Treats Zoo Waffle Maker – These freshly home baked waffles are guaranteed to be a firm dessert or breakfast favourite with youngsters. Three delicious Zoo Waffles come in the shape of Cheeky Monkey, Elephant and Giraffe – just pour the waffle mix into the moulds, close the lid and hey presto in minutes you have three crispy waffles. Have fun topping them with syrup, ice cream, or a healthy warm berry compote – yummy! Sweet Treats Smiley Pancake Maker - Kids will love these delicious smiley pancakes – and no need for a frying pan! Simply pop the batter mix into the moulds, close the lid, wait for them to quickly cook and pop them out onto plates ready to feed those hungry mouths! As an extra treat, drizzle a little syrup, or honey over them and top with a lovely dollop of ice cream. Sweet Treats Popcorn Maker – Create a tasty popcorn treat at home in minutes with the new Sweet Treats Popcorn Maker. Fast and easy to prepare, simply place the popcorn kernals inside the machine and wait for that delicious snack pop out of the machine ready to enjoy with your favourite movie! •	A wide range of ‘themed’ photography is available for Birthdays; Halloween; Christmas; and other Celebrations! This press release was distributed by ResponseSource Press Release Wire on behalf of Dianne Kenyon Communications in the following categories: Children & Teenagers, Home & Garden, Food & Drink, for more information visit https://pressreleasewire.responsesource.com/about.